Local Priest Survives Death March, Returns to "House of Studies"
In 1926, the Dominican Friars opened their “House of Studies” at the corner of Harlem Avenue and Division Street in River Forest. Formally known as the St. Thomas Aquinas Priory, the House of Studies was modeled after the castle of the family of St. Thomas Aquinas, a Roman Catholic theologian and philosopher who lived in the 13th century. It functioned as a Dominican priory for more than 80 years, before closing in 2012. The Dominican friars housed there taught in several Oak Park and River Forest schools, including Fenwick High School, St. Vincent Ferrar, and Rosary College (later Dominican University). One of the Priory’s early residents was Father John L. Curran, a Boston native who had been ordained in 1933. Shortly after the Japanese attacked Pearl Harbor in 1941, Father Curran joined the army as post chaplain at Langley Field, Va. He was soon sent to the Philippines, which had been invaded by the Japanese in the early months of the war. Assigned to a hospital unit staffed by a regiment of Philippine Scouts, he was awarded the Distinguished Service Cross by Gen. Douglas MacArthur in recognition of his performance under heavy shellfire. On April 9, 1942, he was captured at Marivales, one of the 75,000 American and Philippine troops who were surrendered to the Japanese by U.S. General Edward King Jr. The Japanese immediately began to march their prisoners north, in a nightmare that became known as the Bataan Death March. More than 5,000 Americans died during the 60-mile march. But Father Curran survived, and was the only Catholic chaplain at the infamous Camp O’Donnell. During his first month there, he officiated at approximately 1,000 burials. For two years, he ministered to segregated dysentery patients. In 1944, he volunteered to accompany the American POWs who were being transferred to the prison camps on the Japanese mainland. 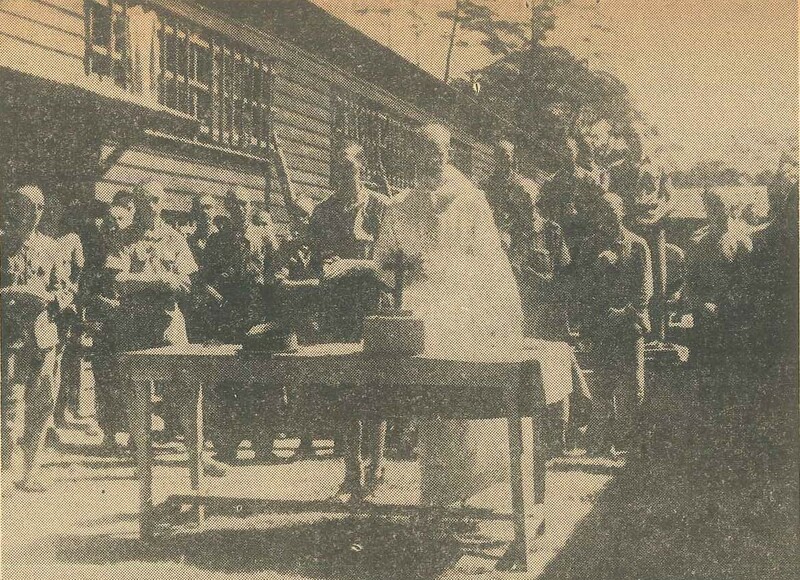 He was imprisoned at the Fukuoka prison camp, where a prison guard took a picture of him celebrating a Mass for his fellow American, Dutch, and British prisoners. As the war drew to a close, the prisoners staged an uprising, overpowering their guards. Father Curran purchased the photo from the Japanese guard, and it was published in the Oak Leaves. Upon his return to the States, Father Curran was admitted to Vaughan General Hospital, a part of the Hines VA Hospital Complex, where he was treated for malnutrition and beatings. He returned to the House of Studies for a short time before accepting a new assignment in Louisiana.